A Luxury accommodation in Salthill with sublime views and within walking distance of Salthill Promenade, Galway Golf Club and the beach. Seashore Lodge is a purpose built family run Bed and Breakfast overlooking Galway Bay on the coast road to Connemara R336. We are close to the main bus routes to Galway City and just an eight minute drive away. Salthill Promenade, Leisureland Fun Park and swimming pool is also just a short distance away. The Costello Seashore Lodge B & B in Salthill has become a much anticipated 'second home' for travellers looking for the ideal combination of quiet, quaintness and hospitality during a short break or extended holiday. 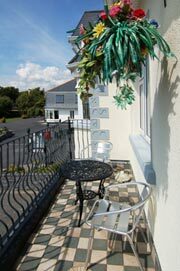 Upon arrival you can enjoy refreshments, with tea & coffee making facilities in each room. The Lodge can hold up to twenty people at one time - each in classic, quaint Irish-home style. With so many B&B's to choose from, what makes this lovely lodge so exceptional is the gracious hospitality and friendliness of the hosts. Such an atmosphere has promoted a most enjoyable dining experience amongst guests. Food quality and quantity is excellent, and at the end of a days activities you can have a final cup of tea as you watch the sunset over breathtakingly beautiful Galway Bay. Noreen at Seashore Lodge can arrange for you to be collected and returned by the local tour operators to all the popular tourist spots like Connemara, Aran Islands, Cliffs of Moher and The Burren.